Meg Murry (Storm Reid) climbs an invisible staircase in search of her father. A Wrinkle in Time might be a science fiction epic that takes place across galaxies, but its story is surprisingly small. It’s about one girl learning to find herself, set against the backdrop of the entire universe. 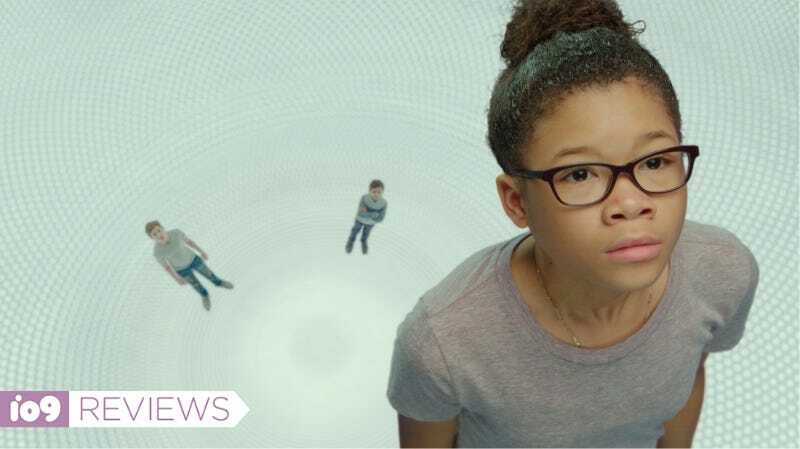 But while the film tries to balance the personal journey of Meg Murry (Storm Reid) with director Ava DuVernay’s grand vision of the cosmos, it never quite connects. The Disney film is the latest adaptation of Madeleine L’Engle’s classic children’s novel. It stars Reid as Meg, a young woman who’s struggling with the loss of her father (Chris Pine), a brilliant scientist who went missing four years ago. Meg is bullied by other girls and gossiped about by teachers, things that infuriate her adoptive brother Charles Wallace (Deric McCabe), who’s supposedly a genius. Of course, everything changes when Mrs. Whatsit (Reese Witherspoon), Mrs. Who (Mindy Kaling), and Mrs. Which (Oprah Winfrey) arrive, revealing that they believe Meg’s father is alive and that she’s the only one who can save him. This leads to a chase across galaxies to rescue Mr. Murry, who successfully used a tesseract to “wrinkle time” and traverse galaxies in an instant. He’s being held on a planet called Camazotz, which is home to a great evil that’s slowly spreading bad vibes throughout the universe. In the computer-generated realm of the Happy Medium . The best thing about this film is, of course, the visuals. In a previous interview, DuVernay said she chose to adapt A Wrinkle in Time because she wanted to create new worlds, and that’s exactly what she did. DuVernay took the planets and stars seen in the book and made them her own, showing us places full of color, life, and beauty. Camazotz has been changed the most from the original novel, in a very unique way, and I really liked it. Unfortunately, the CGI does get noticeable at times, especially during the visit to the quartz-filled cave of the Happy Medium (Zach Galifianakis). And most of the locations in the film have already been shown in the trailers, dulling the grandeur a bit. But these are adult criticisms, and kids will surely be amazed by what’s on screen. Unfortunately, when you take away the costumes, the storms, and the sweeping shots of a giant lettuce leaf floating on the wind, the relatively straightforward story of A Wrinkle in Time gets lost in translation. As I’ve discussed previously, A Wrinkle In Time is a very special book for me. I’ve read it countless times, and Meg Murry is the fictional character I most identified with growing up. However, I believe that movies should stand on their own, and you shouldn’t have to read the book to understand its adaptation. So of course, I have no problem with most of the changes writer Jennifer Lee made from the book, at least in theory. It’s the things the movie kept in that make no sense to me. There are several threads of themes, characters, and plotlines from the book that should’ve been taken out in order to match DuVernay’s vision, but weren’t—or worse, they were only partially taken out, which makes them even more distracting and unnecessary. Nicknames are awkwardly thrown around, used once and then discarded. There’s Calvin O’Keefe (Levi Miller), or as I liked to call him Cheekbones McOptimism, who’s presented as Meg’s support system but is more just “around.” Mrs. Who’s use of quotes instead of regular speech gets annoying to the point where you’re like “Thank god” when she’s finally able to use real words again. And then there’s Charles Wallace. Meg, Charles Wallace (Deric McCabe), and Calvin (Levi Miller) probably weren’t planning a beach trip today. I don’t want to spoil Charles Wallace’s role in the story for those who are watching the movie without having read the book, but it’s major one, and it’s such that it either needed to be completely included in the film, or excised almost totally. But DuVernay kind of half-kept it in to the point where his arc (and therefore Meg’s) didn’t make any sense. In one scene, Mrs. Whatsit tells Meg how everything in the universe led to the moment she was born. That really got to me, and Reid really brought the same emotions I was feeling in that moment.... but then the story pivots to Charles. Since we’d been following Meg, it was jarring to suddenly see her growth as a person connected to his, when it hadn’t really been before. But since Charles’ story rings much more hollow in the film, we’re not given a reason to care about what he’s going through. Both characters suffer for the decision. It clearly would’ve been better to keep Meg’s journey entirely her own. A Wrinkle in Time will be a fine movie for kids, and it’s something families can watch together. There are some pretty visuals and solid lessons in there—especially for young girls, who can learn how flaws can be turned into strengths. But it doesn’t quite reach the heights that I was hoping for. There are all-ages films that truly embody the idea of being for all ages, like The Chronicles of Narnia: The Lion, the Witch and the Wardrobe. For all the magic in front of and behind the camera, this adaptation of A Wrinkle in Time isn’t quite there. Meg holding an image of her father for the Happy Medium. I do not mean to speak badly about a child actor. McCabe is clearly doing his best, but Charles Wallace is a challenging role and requires a very specific kind of actor. I’d recommend watching David Dorfman (The Ring) in the 2003 TV movie version of A Wrinkle in Time if you want to see the ideal portrayal. After the screening, I heard a couple of women behind me ask why Charles Wallace always went by his full name. “Why not call him C.W. or something?” I kind of agree, because the movie never gave a reason for him going by that name. I was genuinely surprised by the touching moment between Meg Murry and the Happy Medium, where he explains how it’s okay that Meg is afraid her father doesn’t actually want to come back. We mostly see Zach Galifianakis in comedic roles, and it was nice to see another side of his talent... at least for a moment. He did plenty of silly stuff, too. For the longest time I thought Stanley Tucci was playing the red-eyed Camazotz guy, and when it turned out not to be I was kind of mad. There were some major pacing problems in the movie, especially with the random music video montages that seemed to come out of nowhere. I loved the songs, and the soundtrack is cool, but it doesn’t feel like DuVernay got a handle on how to move in and out of those moments. As my coworker Charles Pulliam-Moore pointed out after watching the movie, Giant Oprah Winfrey looks really, really weird. I know they were trying to come up with a substitute for how, in the book, Mrs. Which is only a shimmer, but seeing Giant Oprah randomly strolling in the background on Uriel was hilariously dumb.